Sega would like you to know that they do not plan to nickel-and-dime you and start charging for free lives in Sonic games. Nor do they have plans to imbalance their Sonic games by letting you buy free lives. Why is this is a thing? 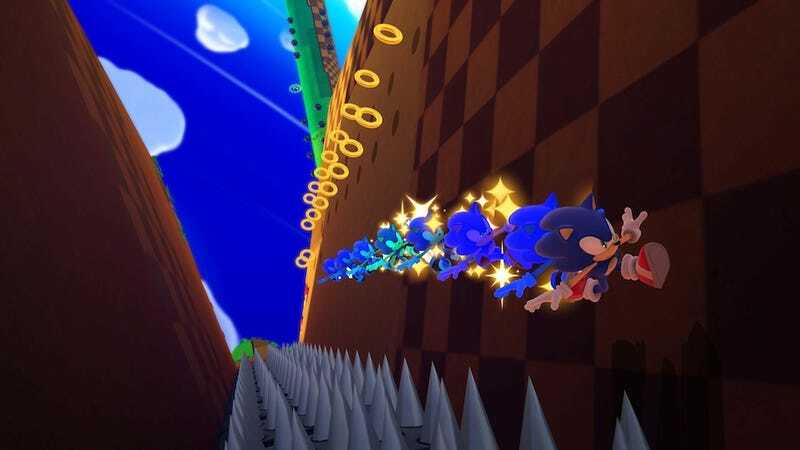 Well, our very own Jason Schreier sounded an alarm earlier this week in his standard understated way by declaring that an Amazon pre-order bonus for the upcoming Nintendo-exclusive Sonic: Lost World (it is still so weird to write that!) that offered 25 free lives was "literally the worst DLC of all time." "We should talk about that," Sega's ever-friendly Sonic-game hype man Aaron Webber told me, when I asked him if he's read Jason's piece. He was showing me the new Wii U game at Nintendo's New York City offices. Before I give way to the back-and-forth transcript on this, let me point out that Sega has done things like sell continues in their Temple-Run-style Sonic Dash cell phone game. ...you're paying for a core part of the game: the ability to try again once you've died. In any platformer, that's an integral part of the core design. Some platformers choose to challenge you by testing you over and over again until you figure out how to pull off a tricky jump or spin move; others give you more rope and let you challenge yourself to beat each level with more speed, or more completion, or whatever. By offering extra lives as a preorder bonus (and presumably later for real cash, based on the "downloadable content" line), Sega is damaging the integrity of that core design. Even if they didn't intentionally make the game more difficult in order to get you to put in more money, they've ruined the ecosystem of lives in this game, which immediately makes it less satisfying and less desirable to play. This might sound familiar, because arcades used to do it all the time, and many arcade games were designed to be more challenging so that you'd put in more quarters. Many of today's free-to-play games follow similar philosophies. Ouch. OK, what do you say to that, Aaron Webber? "The way that works is the pre-order bonus is you get the Deadly Six, which are these extra bosses in the game," he said to me. "I believe it's Amazon that had, in addition to the Deadly Six ...this cushion of extra lives that comes with the game when you first get it." "The lives are not really the focus," he added. "The lives are an extra part to the bosses, which is the primary DLC." That's sorta right. There are other retailers offering the Deadly Six DLC without the free lives. Webber, playing a forest level of Sonic Lost World the entire time we're talking about this: "I think there was some question about whether you can buy more lives in-game. That's a no...."
Me, sitting on a couch, watching, thinking: "You can't pay 99 cents and get more lives?" Webber: "That will never be a thing in a Sonic game." Me: "One of the things he was saying as he tried to justify his radical stance was that he was concerned that giving away free lives would potentially imbalance the difficulty of the game to either make the game harder, to push people toward going for the free lives, or in essence it makes the game easier and in a sense devalues the difficulty being presented. What's your sense of the difficulty of this game vis a vis the others and the sense to which having these extra lives impacts that?" Webber: "What I can tell you first is that I definitely understand his concerns but I don't think there's any need for that, thankfully. The game is not built to be so difficult that you would ever need to purchase extra lives. We would never want to put a consumer in a position where they would have to go out and buy extra lives. Sonic games have never been about that, never will be about that. So that's the first thing we should say about it." "The extra lives are a way to let you have a bit more fun being reckless if you want to be. Often, Sonic games, you start with three lives and if you run through, it's game over." "I think Sonic games have become much more forgiving ever since the old days. They used to be, if you ran out of lives and continues you start from the very beginning. Now we have save data and you can go back and play levels again, so it's really all about having that extra cushion. That's all the 25 lives are meant to be. The game is not made to be hard to encourage you to buy those." Me: "How does the difficulty compare to Colors or Generations, some of the recent Sonic games?" Webber: "I would say Colors is a very good comparison for it. I think, depending on how you choose to play and the paths you choose to take, some paths are very easy, some paths are very difficult and a lot of the extras are hidden on difficult paths in order to encourage you to go back and try those harder levels. It might make you lose some lives along the way. "In addition to that, if you ever find a level that's too hard, you can hop into two-player support mode and a second player can help you out to grab rings, destroy enemies, create platforms for you, so there are a lot of options for players, if they do find the game too difficult for themselves, especially if it's a younger child and needs the help of their parent, they can jump in using support mode." Me: "I get that, but obviously a lot of the Kotaku readership is wanting to veer the other way, hoping it's harder, so for that audience, you would say yes there's challenge here that's commensurate with... I don't know if Colors or Generations is the more difficult one?" Webber: "I would say they both had some difficult sections. I think what I would say is that it's up to you as a player if you want to take the easy way or the hard path. Every level has a route that—yes, the later levels are going to be relatively challenging regardless—but there's still going to be those sub-paths that are going to be more difficult. As a player, you can choose: do you want to take the easy way out or do you want to go or that extra red star ring or something. "So, compared to Sonic Colors, compared to Sonic Generations, I'd say it maintains a pretty good threshold as you go later on. That's all I can say for now. I think some fans who are looking for more difficulty may be excited by options that are presented later, but that's all we can say for now." Me: "You video game people and your secrets..."